If you are not familiar with Insolia and the wines from Sicily, this is a very nice example that is clean, expressive, vibrant, fresh and long lasting. Flavors: Harmonious and well balanced with mature, exotic fruit flavors such as kiwi and pineapple. The finish is persistent. Goes well with classic Italian food, such as Risotto with mushrooms and walnuts or veal dishes. It is also delicious when paired with exotic sushi, such as Salmon sashimi. The Nicosia family,today, runs the farm or "Azienda Agricola Mortilla", situated on the slopes of the Iblei Mountains in the district of Chiaramonte Gulfi, in the province of Ragusa. This family after many years of experience in growing various kind of farm produce particular must grapes,citrus fruits, prickly pears,persimmons and olives, conviced the family that it was time they made a decisive contribution towards the rebirth of Sicilian wines. This particular area is perfect to growing grapes and therefore the innovative changes introduced by the Nicosia family,always ahead of the times and tenacious cultivators of vines for generations, have made it possibile to produce wines with a well defined personality. The young vines planted and cultivated on their land at Roccazzo represent the determination and commitment towards a long-term method of selection and improvement of the best of the local grape varieties. This wines were introduced for the first time, at Vinitaly Wine Fair in 2002, gaining recognition and earning a flattering success, enough to encourage and continue the program of company development. Today the company continues its development with the support and the active inclusion of "young" sons of Guglielmo and Salvatore, a sign of desire and will of the family Nicosia to continue this long and ancient wine tradition. The Nicosia family, att he end of the 19th Century began to devote itself to growing wine-making. Handed down secrets and cultures,from their ancestors,for many years,they became qualified in wine-growing and wine-producing-sector. Among ancestors,can be remembered the brothers Salvatore and Biagio Nicosia , called "Turi and Suzzu re Saraceni" who produced wines in own builts-up area, and they devoted themselves to the transport and selling all over Sicily ,practing the famous job of "Carrettieri" or carters. they opened during the forties, a wide wine cellar called "Funnicu" where the carters would stop and where one could commercialize and taste the wine. the currents owners with their father, planned the restructuring of the old wine-farm. Insolia or Ansonica: ancient vine of Sicily, it has been no doubt the prince of the Sicilian cellars, before Sicily became earth of election of the great red wines of native grapes and from international grapes.This splendid grape, grape wine's daughter,resistent to the drought,and it growed in Sicily always and it spreaded in the course of centuries also in Sardinia ,in Elba Island and Giglio Island,thanks to Greeks merchants. The Insolia express the best itself,with hot and airy climates,vinificated in pureness,give full-bodied wines and wines of long ageing,but today the tendency is that of combine-it to grape of out place of origin for example the Chardonnay and together with native grapes to make wines of distinct international flavor but that at the same time,express a strong sicilian connotation ;moreover it belongs to composition of nine Sicilian D.O.C wine. 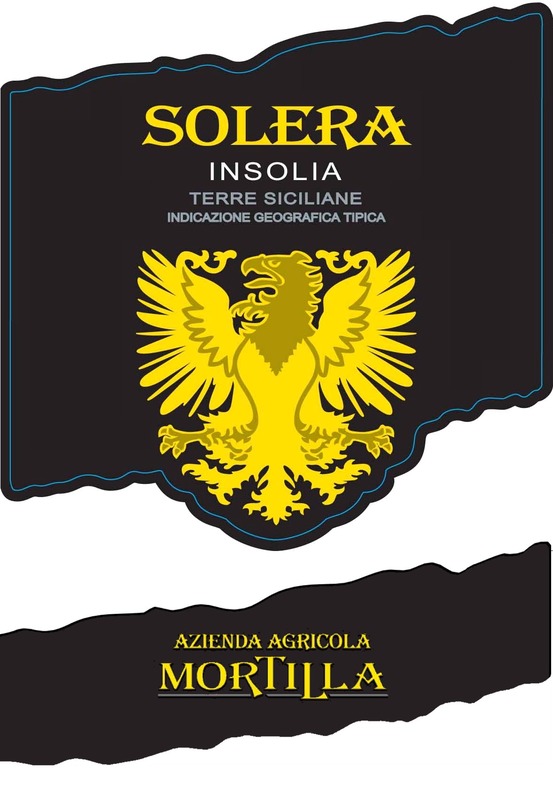 The Insolia is straw-yellow colored with green hues, spacious and subtle bouquet, with good intensity; in the flavor result full-bodied,of great structure, in particular are very appreciated the fresh sensations of the Insolia, in harmony with the traces of fruit dry. Today, the secret adopted by Mortilla agrarian farm is select rigorously the grapes them turn originated from a valuable particulary clone "the Dama Sciandone" ,and treat the native wines, as just the Insolia, in the same manner of that internationals and noblest wine.